Most programming languages today deal with objects, a concept called object-oriented programming. Although Excel VBA is not a true object-oriented programming language, it does deal with objects. Excel VBA object is something like a tool or a thing that has certain functions and properties and can contain data. 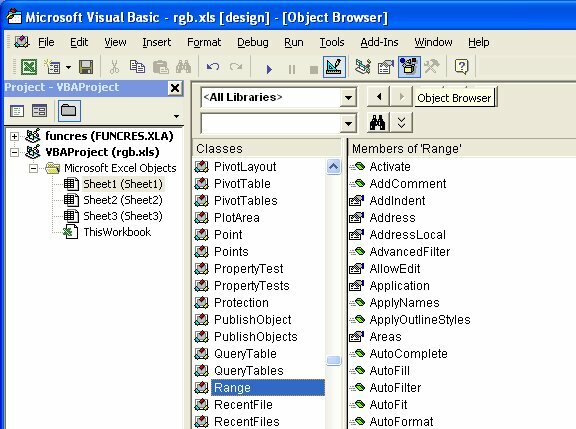 For example, an Excel Worksheet is an object, the cell in a worksheet is an object, the range of cells is an object, font of a cell is an object, a command button is an object, and a text box is an object and more.In order to view the ExcelVBA objects, click object browser in the Excel VBA IDE and you will be presented with a list of objects(or classes) together with their properties and methods, as shown in Figure 17.1. An Excel VBA object has properties and methods. Properties are the characteristics or attributes of an object. For example, Range is an Excel VBA object and one of its properties is value. We connect an object to its property by a period(a dot or full stop). The following example shows how we connect the property value to the Range object. This statement will fill cells (1,1) with yellow color. Notice that although the Range object specifies a range from A1 to A3, the cells property specifies only cells(1,1) to be filled with yellow color, it sorts of overwriting the range specified by the Range object. Another object is the font that belongs to the Range object. And font has its properties.For example, Range(“A1:A4”).Font.Color=vbYellow, the color property of the object Font will result in all the contents from cell A1 to cell A4 to be filled in yellow color.